Tweeting was the breakout Web term for 2009. The early favorite for 2010? Checking in. That's the basis of Foursquare, the gorilla in a new wave of location-based social-networking sites. While sites like Facebook and Twitter are interested in what you're doing, Foursquare is more interested in where you're doing it  and using different ways to reward you for checking in. Launched in March, Foursquare turns city maps into game boards. Members use text messages or applications for iPhones or Android phones to post when they are at a location like a bar or a restaurant. 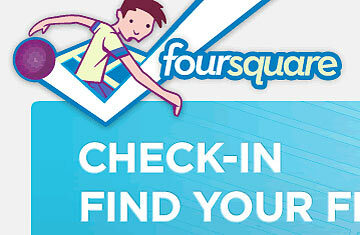 As incentive to share, your current location shows up on the Foursquare map to help you meet up with friends. Check in enough times from a coffee shop, for example, and you're dubbed its mayor. Give a shout-out from your gym 10 times in a month, and you might get a badge that dubs you a "Gym Rat." That gaming component is the site's secret sauce  one that pushed it past 150,000 users before the end of 2009. Co-founder Dennis Crowley says Foursquare counts on users' becoming protective of their little territories. Foursquare is birthed from Crowley's previous effort, a now defunct site called Dodgeball that was bought by Google in 2005 but stuggled to expand beyond a few thousand users. Dodgeball had the map part but lacked the game, and when Crowley left Google in 2007, he tried to figure out how to make his next effort more fun. "Once we started resurrecting Dodgeball, we thought adding game mechanics might make it something really interesting," Crowley says. "And it really took off and became sticky with a lot of users." But Foursquare has some heady problems to face before reaching critical mass. There's competition from a slew of similar sites, including Google Latitude (reborn from the wreckage of Dodgeball) and Gowalla, and there are rampant rumors that both Facebook and Twitter are interested in figuring out new ways to harness user locations in 2010. But the biggest challenge? Taking something that's popular in the young, tech-heavy communities on the coasts and making it appeal to moms and dads in between. Foursquare is active in more than 100 cities, but the key to getting new users is the site's plan to work with businesses to give freebies to loyal users. So far, some 200 businesses have signed on, including the Modmarket eatery in Boulder, Colo., which gives free pizza to users who check in 10 times and a free drink to the current mayor. "We get multiple people coming in and mentioning it," says owner Anthony Pigliacampo. "We're pretty psyched about it." Christine Lu, the digital strategy advisor for the national burger chain Fatburger, pushed stores to give secret menu deals to users who flash proof that they've checked in via Foursquare. "The challenge with any social-networking site is the single mom working in an office  what's in it for them?" Lu says. "If you can translate it into the mentality that this is saving you money, who wouldn't want to use it?" Partnerships like these are currently free for businesses; Crowley says Foursquare is still trying to figure out how to make rewards even more useful for its members. While Foursquare isn't under any immediate pressure to make money  the site received $1.4 million in an August round of funding  its partnerships with businesses provide at least a hint of the way it plans to turn its traffic into a revenue stream. And in an online world crowded with Next Big Things still struggling to turn a buck, that may be the most revelatory thing about Foursquare yet. Read "Anonymous Employee Reveals Ugly Details of Facebook's Inner Workings." See the top 10 gadgets of 2009.